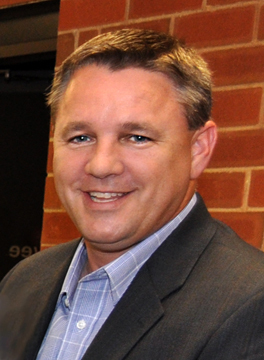 Kirk Edens, the Chairman of the Southeast Concrete Masonry Association (SCMA) has announced that James Cain (pictured) will be the next Executive Director of SCMA. Mr. Cain lives in Forest City, NC with his wife and son. A graduate of Appalachian State University, he is a volunteer with the American Red Cross, Habitat for Humanity and other charitable organizations. Chairman Edens says, “James brings more than twenty years of experience in sales and market promotion. He has done business with companies in the aggregate industry including CEMEX and Titan America. James comes from a national sales background with GE and Vector… he took it upon himself to visit block plants in Virginia and North Carolina as well as to reach out to Major Oglive to better understand the impact of the (CMU) Check-off Program.” Mr. Cain began his work with SCMA January 7th. Among his first priorities will be the promotion of the new CMU Check-off among producers in the SCMA states. Mr. Cain introduced himself to NCMCA at the January 9th NCMCA Board of Directors meeting. In mid-January, the NCMCA Western Carolina Chapter held its Annual Winter Social in Hickory. Among the highlights of the evening was the addition of a new name to the list of chapter members included on the "Founders Award" honor roll. The late David R. Sigmon was NCMCA President-Elect at the time of his passing in 1998 and had been a champion of masonry training across the state. The award for top score at the annual NCMCA Samuel A. McGee Masonry Apprentice Skills Contest is named in his memory. David Sigmon's wife Jane (third from left) and her family were in attendance to accept the plaque on the family's behalf. Left to right, chapter president Larry Kirby, David's daughter Dedra Sigmon Foster, Jane Sigmon, son Drew Sigmon and his wife Jenny, and past NCMCA/MCAA president Alan Griffin who made the presentation announcement. The Founders Award recognizes Western Carolina Chapter members, both past and present, who have made extraordinary contributions to the chapter and to the masonry industry. Chapter leaders also used the occasion to present Past NCMCA President Wayne Starr’s family with the “NCMCA Lifetime Membership” plaque that was approved by the NCMCA Board of Directors just before he passed away in June 2018. NCMCA President Kent Huntley and NCMCA Central Region Vice President Brandon Hartsell were among the evening’s guests. The dinner was made possible by these sponsors: Statesville Brick, Southeastern Concrete Products, RBD & Associates, Kerr’s Hickory Ready Mixed Concrete, Hydro-Rents Carolina, Eckard Brick Cleaning, Adams/Oldcastle, and ACT Equipment.